OPTIVISC M is a non-surgical, non-pharmacologic therapy for Knee Osteoarthritis, a disease of joints characterized by a progressive degradation of the cartilage and bone deformation. OPTIVISC is a treatment for patients who suffer from Osteoarthritis showing symptoms like knee pain, stiffness, articulator limited mobility, crack, swelling, functional impairment and even deformations. OPTIVISC M is highly viscous gel formulated with high molecular weight (4.2 to 4.5 Mio Dalton) injectable grade hyaluronic acid from bio-fermentation origin, HA gel indicated for use as an intra-articular injection in the patients suffering from Osteoarthritis of knee joint. 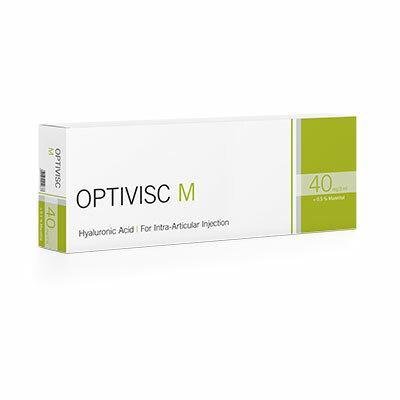 OPTIVISC M is sterile viscoelastic gel having 40 mg of HA – 2% concentration + 0.5% of the Anti-Oxidant Mannitol. OPTIVISC is the exogenous source of Hyaluronic Acid that restores the Synovial fluid balance in OA condition. The administration of OPTIVISC increases the viscosity of the Synovial fluid, restoring its lubricating, shock-absorbing and filtering properties. Furthermore, it re-establishes the protective HA coating over the inner surface of the joint and increases the scavenging of free radicals. As a result, inflammation of the Synovium is reduced. This relieves pain and increases mobility of the joint. OPTIVISC M is supplied sterile and non-pyrogenic in Latex-free pre-filled syringes with 2 ml fill volume.